We got to the gold field in Nevada in the hopes of finding gold. This area is known to have a good amount of nuggets and specimens in Quartz. In our how to find gold expedition we are using 2 main metal detectors. We are using a Minelab GPX5000 and a Minelab 2300. We were treated to some amazing sunshine and WIND! 50mph gusts that were picking up my 16″ mono coil and having it be like a kite. We spent the whole day randomly searching for that random nugget to let us know we were ina good spot, I used the GPX5000 with a 16″ round mono coil and I have ALWAYS used elliptical in the past. I made MAY rookie mistakes of digging deep holes only to find the target on the edge of the 20″ hole. My mistake was to assume the targets were deep and use the center of the coil to determine the target. Towards the end of the day my holes were a LOT shallower and my day consisted of all and only iron trash. Lunk used the SD2300 and was rewarded with 2 small nuggets, we were not skunked, we got the stink off and I am writing this portion of the article on the morning of day 3 so keeping it short, the big ones are out there! Today is my day to use the SDC2300 and I look forward to using this metal detector provided by Gerry from Gerrys Detectors and if you like here is his Facebook Page and I immediately notice how much more compact and easy to use it is. Its basically turn it on and start swinging and after about 2 minutes I hear that squeal that indicates a target, (every time I hear that squeal my heart races and I anticipate gold) and after scratching the surface and checking for the sound theres nothing, and I once again experience that disappointment as I look on the pick and sure enough stuck to the magnet is a small piece of iron trash. At 11:30 am finally a signal that doesnt go away when I run my magnet over the target, “Could it be?” I ask myself, and the finally when i get down to the target a stunning wire quartz and gold specimen (weight 2.95 grams). I will clean the nugget more thoroughly of course when I get back home but this was my first one of this hunt and trip. 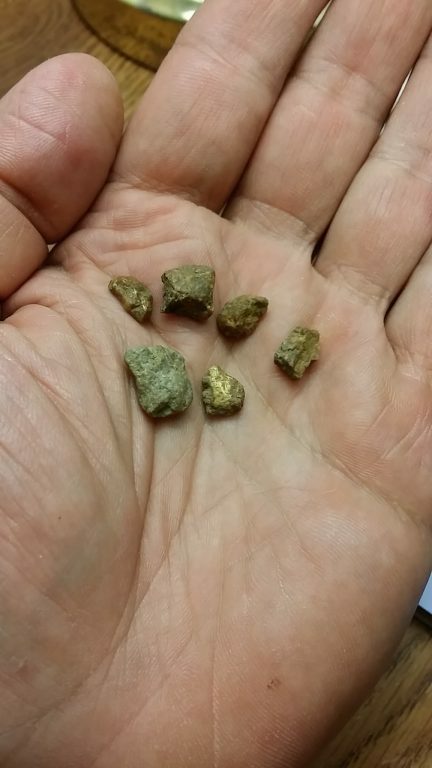 In all we got 4 gold nuggets, Keith found his (the top nugget in the picture, and it weighed 2.88 grams, he got it 12″ down with the GPX5000 and a 16″ Mono Coil. In closing this final picture for day 3, this little beauty weighs 1/2 gram and is a thin foil gold, dendritic wire and birds nest specimen. Notice the great distinct shapes and I know once its properly cleaned will be a stunner! Happy Hunting and stay tuned for day 4 tomorrow! I wake up, I feel super positive, the morning sun is shining and the winds are non existent. Today I get to use the GPX5000 and show Keith how to find the big ones! We arrive at the gold fields about 8:00 am and get setup and make a game plan, after all we have many many many miles of terrain we can choose from. I pick an area that looks promising and has produced gold in years past and I start to hunt, I get a signal, that nice low faint tone and as I start digging the squeal get louder and deeper, and then finally…………at 20″ the target is out of the hole, I check the dig pile and YES its in there! I run my magnet over the pile and “THUNK” a solid chunk of iron, what a let down…….and basically that what my day consisted of. Over 12 holes today over 20″ in depth and Iron or non ferrous trash and bullets in every single hole. Today, I am skunked and very sore and very tired, and that my friends is the REALITY of gold prospecting. There will be days where you work you “keister” off and have nothing to show for it as far as gold………the memories of course are priceless. If you want to learn how to find gold you have to understand there will be days (many of them) where you dont find any gold. Keith “Lunk” Semanko who I have had the pleasure of knowing for about 15 years or more saved our day (using the SDC2300) once again. He got a nugget at 1:15 pm PST. Its an unusual nugget encased in manganese or magnetite. There is only a small amount of gold showing on the surface but its a dense and heavy little sucker. We have now hunted for 3 days and have a total of 7 gold nuggets with at least 1 nugget each day. I have been waking up very early each day here, this morning it was 3:00 Am and I had to read for about 1 hour to fall back asleep. Finally daylight comes and looking at the weather forecast its 55% chance of precip and 42 degrees for the high. We get to the gold fields and today I am using the SDC2300 and Keith has decided to try the Minelab XTerra705 since we are in trashy country and it discriminates. My 3rd signal is BLAMMO a nice quartz gold nugget! Great start to the day! Keith and I are both continuing to detect and he says to me “I think its time for lunch, I havent eaten yet and so far on this trip I have NOT found a nugget until after lunch” to which I reply, “dang, I havent found a nugget AFTER lunch on this trip” and I keep hunting. 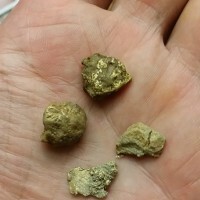 After Keith eats he starts to hunt and sure enough BLAMMO a nugget and I groan because I see how this is gonna go, I wont get another…….and then to my surprise another signal that doesnt stick to the magnet, and………YES another nugget, almost solid gold with very little quartz this time. I yell out to Keith Im now ahead as I have 2 (I already found the first). Shortly after that Keith yells out “I got my 2nd!” I start to swing faster because now hes in the hunt for “MOST” and then 2 minutes later he yells “Number 3, and it was only 12″ away from #2” and then BANG #4 as the sun starts to slowly set…..Total take for today is our best day. 6 gold nuggets so far and a great place to start in the morning. The lesson we learned today was that “Keith should eat lunch at 8am” 🙂 Happy hunting! I just move to Nevada and i was told i can go to jail if i metal detect out here . Is there anywhere that i can metal detect with going to jail ? Yes, most areas are open to metal detecting, where in Nevada? Any suggestions on locations to try out? I am very new to this but have been rockhounding and exploring southern Nevada for a long time. I have for some time been under the impression that Nevada does not produce so we have been making our way to Arizona but would be awesome if we could do this closer to home. I saw your post regarding Keith “Lunk” Semanko. Keith was in a short demo film production we did in Lovelock Nevada a few years back along with several of his Nugget Shooter friends like “Smokey” Baird, and we produced a demo film that I think he would be interested in getting a copy of. Do you know how I might be able to reach him?